You know the stores at the W Hotels sell a variety of weird stuff, right? Some are more familiar to us, like DVF dresses and Seychelles shoes, but there are also some random finds too. Pan for god at their big warehouse/sample sale. Overstock jewelry, accessories, bags, shoes, beauty, miscellany, etc will be up to 70% off. The LaRok Nile dress is $70 (originally $278), the Wink Mia jumper is $38 (originally $152), Gorjana Poppy stack rings are $35 (originally $70), and the Madison Marcus Lunar Bow dress is $72 (originally $285). 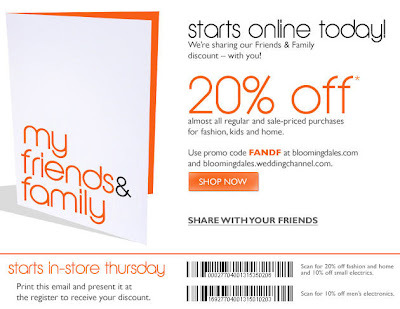 Bloomingdale's has started their F&F event online. Use code "FANDF" to take 20% off on clothing,home goods and wedding registries(!) or 10% off small electronics. Or, print out the email and shop in-stores starting Thursday. No discounts on beauty-- see exclusion list below. Ends Sunday, Oct 4. Chanel, Ralph Lauren Black Label, Paul Smith, Turnbull & Asser, The North Face, Dior, Fendi, Jimmy Choo Sunglasses, Louis Vuitton, Agent Provocateur, UGG® Australia, David Yurman, Gift Cards, Cosmetics, and Fragrances. 10% off offer valid only on Small Electrics and Men's Electronics. Certain designer and brand exclusions apply. Discount offer not valid on Cosmetics and Fragrances, Maximilian Fur Services, Martine's Chocolates, Shop at Home Services, Rug Cleaning Services, Interior Design Special Orders and electronic gift cards. A little bling coming our way, mayhaps? 40% off is not too shabby!! I'm definitely looking forward to checking this one out! If you don't live in NYC, but you have something in mind, give them a ring. A whole slew of 70% off goodies has been added to ShopBop's sale section! Free shipping. I normally don't endorse GAP, but 25% off... use code "SAVE25". Ends Wednesday, Sep 30. Update: False alarm, this isn't the normal Beauty.com F&F. You can see the brands included in this promo here. Between Beauty.com's (Sep, 20% off), Saks Fifth Avenue's (Oct, 15% off beauty), and Sephora's (Nov, 20% off) F&F events, my bank account is gently coaxed of all its holdings. 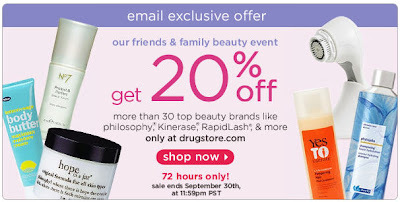 Starting today until Wednesday, Sep 30, use this link to get 20% off at Beauty.com. Make sure to plan strategically to ensure you get it all (your Bliss, Strivectin, La Prairie, Chanel, and Fekkai) at the best discounts. Helpful hint: Beauty.com doesn't charge tax unless you live in WA, NJ, or NY. If you know someone, maybe you'll be able to finagle an invite to the preview, but otherwise, plan on taking a nice long lunchbreak this Friday. 7 for all Mankind is doing their first public warehouse sale (I'm guessing both mens and womens) and prices start at $65, $55, or $45 depending on which day you go. Make sure to RSVP before you head out to avoid any begging and pleading. Not to jinx this span of good discounts, but is there ever a reason to buy things full retail from Tobi.com? * Use code "LAYER25" to take 25% off until Wednesday, Sep 30. *Well, yes, if you are looking for A.P.C., Alexander Wang, Anthony Logistics for Men, Comme des Garcons, Converse, Hudson Jeans, Nixon, T by Alexander Wang, or Robin's Jeans. 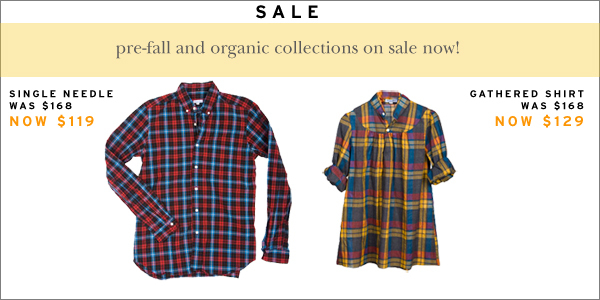 StevenAlan.com is taking 30% off a good selection of mens and womens pre-fall and organic shirts. Very nice. I am not a Lucky Mag subscriber, so it's a good thing my coworker gave me a heads up on the Lucky Magazine Boutique Crawl! Tomorrow night in West Village, a number of stores on Bleecker St will be running little promos to entice your wallet to come out and play. This is like a mini more-organized Fashion's Night Out with less champagne and more discounts, which makes it infinitely more appealing to me. Check out the website to print out your Lucky Buck$ (PDF)! If indoor rock climbing is your thing (and you live in or don't mind going to Brooklyn), look at this. For $50 you can get a "Learn the Ropes" class and 2 day passes to Brooklyn Boulders (normally $150). After a fun evening of getting totally drunkface off champagne at our fav restaurant (celebrating our 2nd yr wedding anniversary), this YOOX.com free shipping coupon is good. Even better: it works on all the end-of-season clearance merch. You need to use the link below. Hermes is doing their thing. Prepare for (classy and refined) madness. A word of warning: tomorrow AM may be invitation only, so I'd suggest going after noon. Toss out your Murano jewelry and kick it up a notch. Save up to 70% off Baccarat crystal bracelets, earrings, pendants, necklaces and rings. Prive will be hosting another sample sale this weekend, but alas, I don't know what brands will be on sale. However, I can say with certainty that every time I've popped by, I've always bought something :P so it can't be that bad! This one will be fall clothing for men and women. 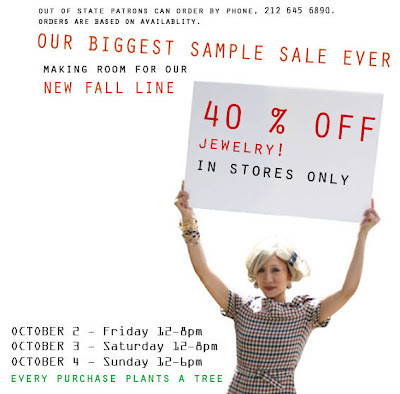 I am currently taking a breather before the onslaught of fall sample sales, but this one looks good. Sample & stock sale. Save 50 to 70 percent off Slane & Slane designs, inspired by classic architecture and mythology. This sale will offer a large assortment of 18kt gold and sterling silver rings, necklaces, pendants, bracelets and earrings. Sterling silver rings for $60 (retail $120), 18k cuff for $1,620 retail $5,400) or their signature freshwater oval pearl necklace for $165 (retail $330). Cash or MC, V, Amex. All sales final. Late notice: 30% off Juicy Couture until tomorrow! Print out the flyer (on facebook) to shop in-stores. No online component, sorry. Ends Tuesday, Sep 22. Starts tomorrow: Domenico Vacca is hosting a sample sale. Select cashmere pieces are $99 (originally $490), silk cocktail dresses and gowns are $99 to $299, and men's button-down shirts are $140 (originally $540). Through 9/24. 14 E. 60th St., nr. Madison Ave., Ste. 900 (212-920-1211); T–Th (10–6). Use code "TREAT" and take 20% off shoes and bags at Piperlime. Ends Wednesday, Sep 23. Exclusions: final sale items, Emilio Pucci, Giuseppe Zanotti, Belle by Sigerson Morrison, Kate Spade, Frye, Donald J Pliner, Brooks and Patagonia. Not the most exciting thing right now, but there don't seem to be many sales going on. So here it is. Apologies for the lack of posts over the past few days. My friend from Chicago came to visit, and we spent all day (morning to midnight) eating and shopping. Needless to say, it was incredible. We walked through the NYU area (East Village) on our way to Soho and came across some good sales. At Samples for (eco)mpassion, there is a small selection of Kenneth Jay Lane necklaces ($39) and bracelets ($29), in addition to clothing from a couple of designers I have never heard of. 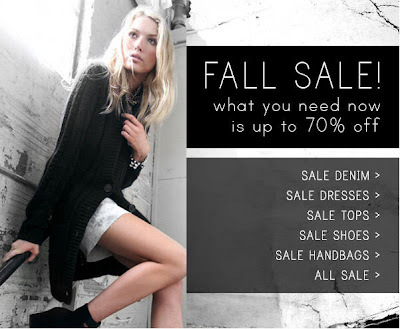 At BasicBasic, there is a huge selection of tops at 25%, 50%, or 70% off. Their main brands are Nation LTD, Petite Bateau, Splendid, James Perse, Three Dots, C&C, and tons more. I spotted some Rachel Pally as well. The online shop, Tee-Zone.com, is doing a promo now of 15% off anything and everything. Use code "GOODY". Ends Thursday, Sep 24. Use code "BYESUMMER" to take 25% off the new non-sale merch at Tobi.com. Ends Friday, Sep 18. Excludes: A.P.C., Alexander Wang, Anthony Logistics for Men, Comme des Garcons, Converse, Hudson Jeans, Nixon, T by Alexander Wang, and Robin's Jeans. Designer denim mecca The Warehouse Sale is coming. Starting Friday, the sale will consume the Metropolitan Pavilion with over 20,000 mens and womens items up to 80% off. There will be jeans but also tops, jackets, hoodies, dresses and other mish mash. Brands will include 7 for all Mankind, AG Jeans (woohoo! ), Antik Denim, Chip & Pepper, Christian Audigier, Ed Hardy, Laguna Beach, Rock & Republic, True Religion, William Rast, and many others I am too lazy to list off. There is also a Buy-4-Get-1-Free incentive. RSVP to avoid paying a $5 entrance fee. Or, pick up a promo postcard which can be found at totally random stores (I found mine at my pet food place), which gives you free admission plus $25 off every $200 spent. Of course I am biased here, but Charles P. Rogers beds are awesome. The quality is just superb, and the local delivery service is pretty much white-glove. They assemble and everything! And all good things come at a price, so jump on this opportunity to get a great discount (plus free delivery, which is a rarity). This sale 'goes public' on Sunday, so hurry and beat the crowds. As low as it's gonna go. YOOX is cleaning out its inventory (and who knows where it's going). Ends Wednesday, Sep 30. Click through the email and have $20 taken off your purchases of $100+ at Beauty.com. And, of course, shipping is free for $50+. Ends Tuesday, Sep 29. 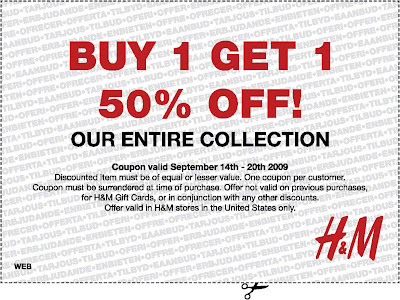 My lovely coworker felt compelled to send this to me, and in keeping with the spirit... Print out the below coupon (PDF) to save 50% off on the equal or lesser priced item for every 2 items purchased at H&M. One coupon per customer. Expires Sunday, Sep 20. It is a must! Everything is 50 percent off—Tag, Movado, Breitling, Rado, Dior, Gucci, etc., etc., etc.—and the selection is gorgeous. The prices don’t go down as the week goes on and they don’t get new merch either. Soiffer-Haskin is back from summer break. Kicking things off: a Tourneau sample sale of new and pre-owned watches, jewelry and writing instruments, all 50-70% off. Most of the brands they carry in their stores will be available except for Rolex and Patek Philippe (darn it!). 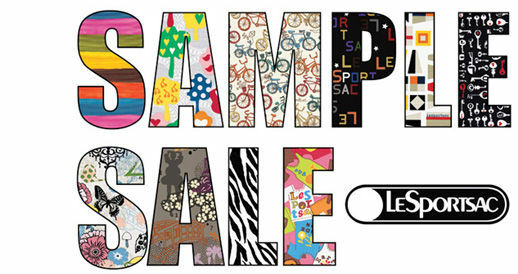 Another LeSportsac sample sale, just in time for autumn. If you have something specific in mind, go during the VIP hours. If you want a good deal, wait til the last day! Paragon Sports is clearing it out! Get some heavily discounted summer sports paraphernalia or prepare for winter. Saving and protecting animals is near and dear to my heart. Fortunately, so is shopping! Indulge your inner saint during Christofle's charity event. On Tuesday, Sep 15 and Wednesday, Sep 16, Christofle will be donating 15% of all sales to the Picasso Veterinary Fund, a special fund that assists in the veterinary care of injured or ill babies waiting to be adopted in our NYC shelters. And if that wasn't incentive enough, you'll even get a glass of champagne AND $50 giftcard for spending more than $100+. On Sep 2, I received an email from Cole Haan touting their Fashion's Night Out event: watching the mens quarterfinals in their tennised-out Madison Ave store. The headline stated that Maria Sharapova would be popping in to help shill the line of accessories she had a hand in... inspiring? designing? something. However, come Sep 8, I receive a new announcement hyping up their astroturfed floor and mysteriously omitting the guest appearance. Guess she didn't anticipate having no other reason to stay in town other than smile and wave. The good news is, you can snack on Dylan's Candy Bar yummies while ogling Nadal. During the San Gennaro festival (Monday, Sep 14 - Monday, Sep 21), Openhouse Gallery will be hosting a sale and flea market. I have no idea what will really be on sale aside from the general categories: mens/womens clothing and shoes, hats, jewelry, artwork, and other mish mash. I suppose if you are wandering the streets during this time, you might want to pop over and see if they have anything good! Bliss is doing some good discounts on beauty sets and some brands, but it looks like the catch is you can only do one per purchase (although I have not confirmed that you cannot use multiple promo codes at once). This weekend only. Click on the image below to see all the codes. 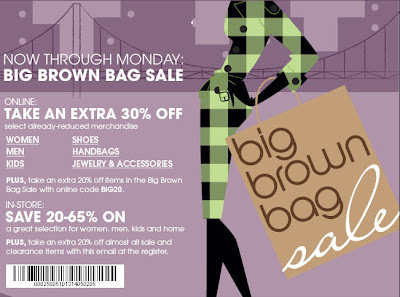 Bloomie's is doing their Big Brown Bag Sale, and a lot of their online sale merch has been marked down another 30%. Use code "BIG20" to take +20% off items designated in the 'brown bag'. However, we all know that in-store shopping is where it's at. Print the email to take +20% off almost all sale stuff in the store. Ends Monday, Sep 7. I can't ignore it any longer. The weight of the incoming event emails and publicity is crushing me. Fashion's Night Out is a celebration of fashion, organized in NYC by Vogue Magazine and CFDA. Various venues and retailers will have special events, ranging from the basic cocktails and hors d'oeuvres (almost everywhere) to having your picture taken with Carla Bruni and Anna Wintour cardboard cutouts (Be & D event at Saks). There are more free giftbags w/ purchase than I care to list, but be sure to check out your fav store to see if they have 'shopping incentives'. Also, for eye candy, it looks like all the major jewelry houses (Harry Winston, Fred Leighton, VC&A) are going to be doing extravagant displays. Here's an incomplete list of notable events I'm compiling. Check the website for the entire listing (there's a ton!). Billionaires Boys Club - Pharrell Williams is manning the cash register! Daily Candy has a Tobi.com coupon for 30% off the fall collection/full-priced merchandise. Use code "TOBICANDY". End date unknown. * Excludes sale items and all A.P.C., Alexander Wang, Anthony Logistics for Men, Comme des Garçons, Converse, Hudson Jeans, Nixon, T by Alexander Wang, and Robin’s Jeans. Today only, get 2 free undies with any purchase from Victoria's Secret. (They are celebrating their 2 million Facebook fans.) In-store only. Get your coupon here (you need to print it out). 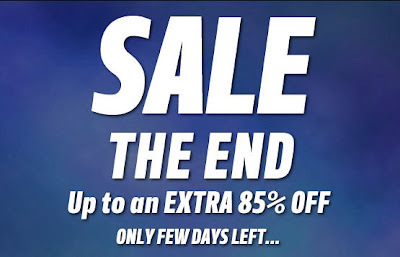 YOOX.com's summer sale merchandise has hit 80% off (well, a good portion of it anyway). Use this link to get free shipping. Ends Sunday, Sep 13.